Didn’t get as much done this week as I’d hoped, but a little luck balanced that out! 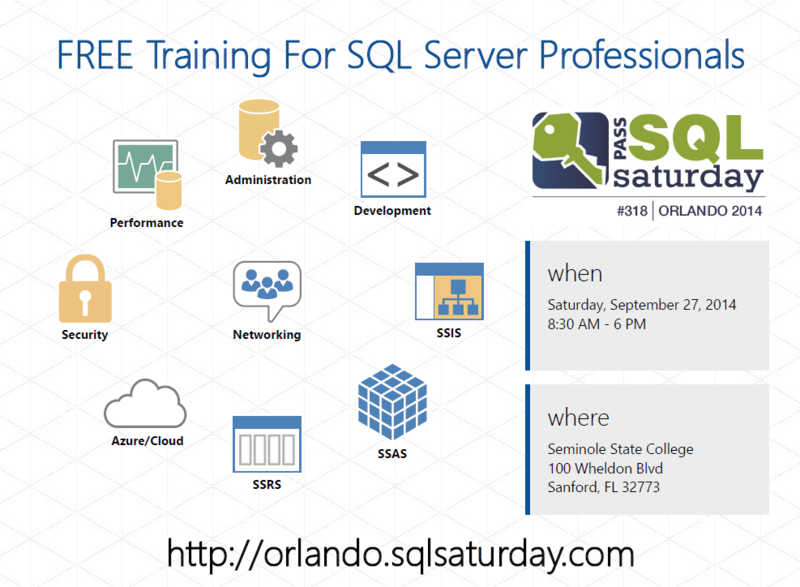 I do at least a weekly call with Kendal Van Dyke (leader of SQLSaturday Orlando this year) to keep him informed and brainstorm and as of my last update we were still not there on the event flyer, with me conscious that while it was worth some effort, perfection is a goal seldom attained. Still, my worry was that the best one so far wasn’t quite there, so we talked about trying one more time with a metro style look. Not perfect, but checks the boxes on what we wanted. I’m not sure about the networking part in the middle, not sure we call out SQLSaturday largely enough, but it does send the message we think we want to send. It also lends itself to replacing the left 2/3 of the flyer with the information about our seminars for the seminar flyer, far more so than the others we have. We’ll go back and forth on this one a little, but I think it will be this one and the retro one. We’ll post both because we have them, and then experiment from there. My goal is to be done by June 21, hopefully sooner, with all the flyers. An interesting point to think on this we’ve spent weeks on this mainly because we had weeks to spend. Ideas need time to percolate. I’m hoping we can reuse this work next year, but it’s too early to know – we’ll just wish and hope it works out that way. On my list for this weekend is to send Kendal the text for the seminars. We’re going to omit photos, go with a title and short(er) abstract and author name, with the price shown prominently – and then see how it looks. TODO: I may have mentioned in an earlier post, but not only would it be nice for PASS to create a handful of flyer templates, it would also be nice if we had a place to go view a gallery of what’s been done. Maybe there is a wiki page already? Need to check. After a week like this I’m really glad I have my notes to refer back to and I’ll be doing that this weekend too, getting back on track next week and planning to be offline the following week for vacation.